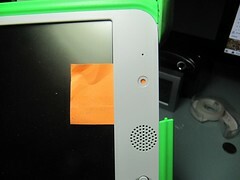 After reading several articles about the alleged spying that was enabled by a Pennsylvania school district via its one-to-one MacBook, and seeing discussion on a variety of mailing lists, I've decided to implement my own zero-cost, no-hassle solution to the problem for the OLPC XO-1's camera. This should be able to be adopted in deployments everywhere, by anyone with a piece of paper, or anything else they can slide through the plastic faceplate. Just say no to fancy addons and factory-added "shutters" or "covers", make your own! For privacy reasons there is an LED hardwired to the camera, so that nothing in software can keep the light from going on when the camera is recording.